Cold front sweeping down on us today . And there’s just been a long period of being pedal to the metal with retouching in a dark studio . So to cheer us up in the anticipation of a possible new boat shoot , we took the opportunity to look at a few previous briefs in sunnier climes . We were in the South of France and our art director made his first request for the upcoming helicopter session. When doing overheads it’s advisable to have a larger helicopter like the one below that deflects some of the down draft so that you can lean out of the cockpit on your climbing harness and shoot straight down . You will also see from this image that we take portable reflectors in the form of bare legs. We keep these away from the sun as much as possible in order to maintain their effectiveness. However, on this occasion there was only a small Robinson helicopter available and putting the camera anywhere near the door meant that the camera gained ten times it’s weight and shook violently . So the only way to shoot was to ask the pilot to get over the front of the boat and tilt the chopper over on its side while flying sideways along the length of the yacht . This meant putting ultimate trust in our harnesses , and each of us getting maybe one or two frames per pass . And it meant the donut, jet skis and the tenders holding position . And it worked . Enthused by the success of this shot our AD got a new idea. On the next project he wanted us to shoot the boat owner’s helicopter flying above the moving yacht while the tenders ran alongside. This was not so much an exercise in photography as one in communication. We had to be in radio contact with our helicopter pilot, the owner’s helicopter pilot, the yacht skipper and both of the tender drivers. While shooting at the same time. Meanwhile, our helicopter pilot had to be in communication with the other helicopter pilot. Enough cameras and lenses but a sad paucity of ears and mouths. Had to resort to hand gestures with our pilot. Thankfully, it would seem that English translates relatively easily in to French using this system. He only looked offended a couple of times. We can probably put that down to cultural differences. And then there was the brief that scared the superyacht’s captain. Not because of the inherent risk to life and limb of the valiant smudgers, but because of the possible damage to his boss’s boat caused by whirling helicopter blades. We were blessed with a fantastically skilled but, let’s say, slightly eccentric pilot. Having left the airfield at speed, he then skimmed the surface of the sea all the way to the rendezvous with the yacht. Quite a few innocent bystanders were soaked as the spray from the rotor blades hit them as they were sunbathing on their boats. He seemed to be enjoying himself. For us to fulfill the brief, he had to fly helicopter sideways while maintaining a fore and aft position to make sure that we were dead central to the yacht. At the same time he had to maintain height and match the yacht’s speed. All of which he did with great composure. And was he great at close quarters flying. Very close quarters flying. Afterwards, the captain told us that he was more than a little disturbed when at one point the body of our helicopter disappeared beneath the bow and he could only see the rotor tips. We were worried about spraying the boat with too much salt water and the amount of retouching that would involve . TOP TIPS : When using harnesses in the helicopter, we have a personal preference. We use harnesses that we can release from the front. As a wise person once advised us, when a helicopter sinks, it sinks like a bunch of keys. So you might want to be able to disconnect from it asap if you hit the water rather than thrashing around behind you looking for the caribiner. If you do prefer a harness attached at the rear, yoga lessons wouldn’t go amiss. And maybe practice holding your breath . Also, don’t have a lifeline that is too long. If you do fall out while getting a little too enthusiastic, you want to make sure that your climb back in is as short as possible. A mountain rescuer friend of mine said that he recalled an embarrassing incident where the pilot had to land very gently and very precisely in order to avoid squashing a previous occupant who was now dangling beneath the helicopter on a long leash. He didn’t say that it was him, but I did notice he now has a very short lifeline. And keep everything off the floor and firmly locked down. A lens rolling under the pilot’s foot could really spoil your day. And keep your camera firmly attached to yourself. A camera falling from several hundred feet could really spoil somebody else’s day. All at Sea in Fulham? So the agency TMW in the Kings Road called us in for a pre-production meeting about a new project. Great idea and a fantastic brief! 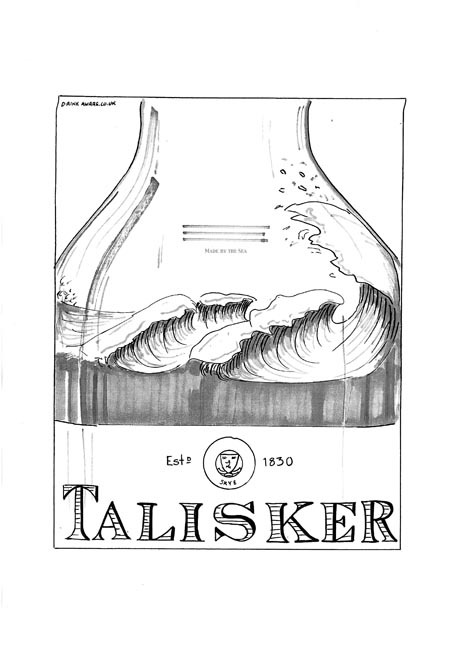 “We’d like to shoot a storm in a whisky bottle”. That’s what they said. “No problem”. That’s what we said. “Oooh arrr…we loves a challenge” is what we thought. Anyways up after a very productive production meeting and our brief and courageous reply, we had to find a way to do it. In the polished world of professional photography the idea exists that everything should be shot with a ruthless calm precision using highly engineered rigs, skilled model makers and, when push comes to shove, a little helping hand in the guise of CGI. And truth be told, it often is. But we all figured “storm” pointed towards something more organic, more disruptive, more chaotic, and ultimately of course less CGI and more fun. We knew that all of the elements were going to be have to be shot separately. First off a good ‘straight’ advertising bottle shot was required, on a white background, nice highlights and straight label. Then there was the storm. We armed ourselves with scaffolding boards, an industrial quantity of plastic pool liner, bendy plastic, a wind machine, several buckets, watering cans, another wind machine, vast quantities of whisky tinted water and a water pump. Unfortunately we forgot the wellies. There followed an intense sessions of splashing and making composite images on the fly. After a serious debate as to how to model the individual waves, we regressed slowly to the equivalent of three year olds in a paddling pool. Liquid everywhere, poured, thrown, blown and pumped. We’d then put on our serious hats on again to assess the results before another session in the pond. It was, technically speaking, an iterative process. It was also, technically speaking, a voyage of discovery in the dynamics of water. Non technically speaking, it was a riot. We got the shots but trashed our trainers, a sacrifice well worth making. Thanks to the sheer enthusiasm and scrupulous attention to detail of the creative team at TMW we ended up with a result that we were all pleased with, including a decision to replace the original white background to a deep blue, which gave the image far greater punch. 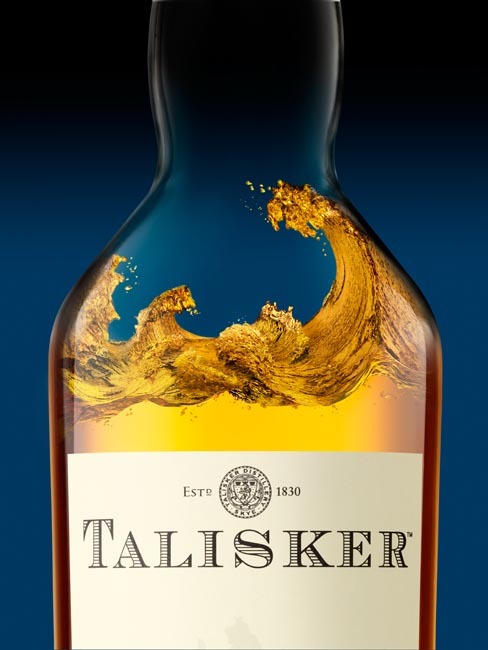 Watch the video of the Talisker retouch progression below. 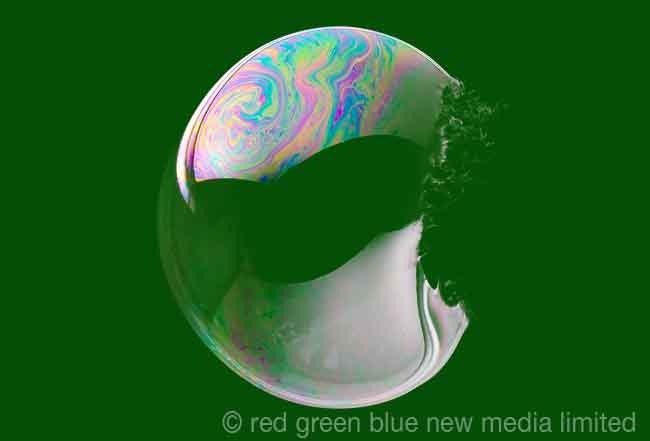 We were fortunate enough to be chosen to produce a series of images of bubbles for a pharmaceutical product. 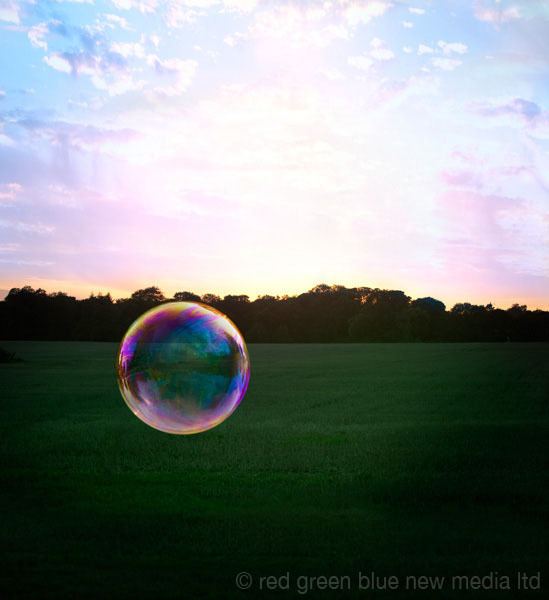 Bubbles collapsing, bubbles wafting across landscapes, bubbles at the setting of the sun, bubbles being distorted etc. It seemed like such a simple idea to start with , but as with all projects required to produce ultimate but effective simplicity, the path to the finished image was a little longer than at first anticipated. Along the way we discovered the optimum speed at which to capture a bursting bubbles strange beauty , how to generate the perfect giant bubble, just where and when the sun sets on the South Downs, and how strangely hikers can treat you when you set up your camera in the middle of nowhere and proceed to blow bubbles into the distance. Oh, and rather bizarrely, the transparency and flexibility of certain brands of condoms ( We kid you not…. we wanted to see if the surface of inflated condom looked vaguely like the surface of a soap bubble. The research was, let us say, “interesting “. Although possibly not as interesting as two blokes standing in the chemists and deciding which of prophylactics on display would look better in our forthcoming masterpiece ). Next stop was to scour all the local toy shops for bubbles and bubble machines. Found the best device though in the pound shop, but it cost £2.45. Briefly considered calling trading standards, but really didn’t want to upset the owner of a store that carried such treasures lest we should need to patronise his emporium for further projects. 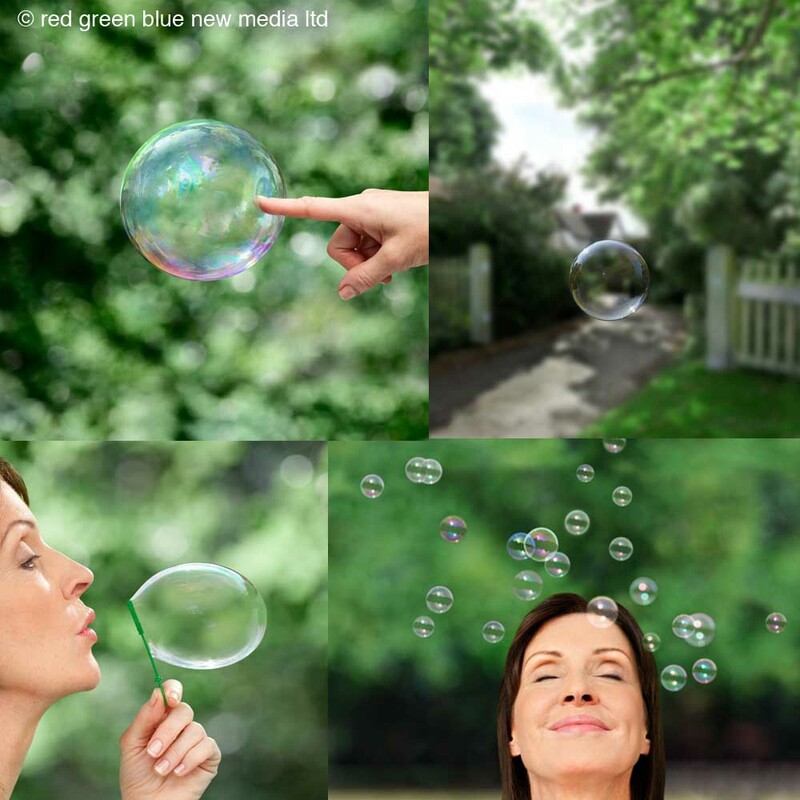 Having equipped ourselves with all the necessary bubble manipulating kit, we set forth to the great outside for the landscapes, and the great inside for some of the more controlled sections of the shoot. Because of the vagaries of the weather, we didn’t have the luxury of assistants for the outside stuff. It was more a case of all available hands on deck as we charmed, persuaded and ultimately begged various family friends,family and bystanders to blow perfect bubbles at exactly the right time and in exactly the right place for us. Remarkably, some are even still talking to us. In the studio, the idea was to operate in controlled conditions. Well we thought that was a sound principle. I suppose that at a stretch, blowing bubbles from the top of a ladder and attempting to get those bubbles to land on various pointy things and the occasional model could be considered controlled. It was at least marginally more controlled than the hysterical laughter resulting from attempting to predict the trajectory of an air filled gossamer film of soapy water. Anyways up, got there in the end. And as usual had a thoroughly enjoyable time getting there. We used the excellent Canon 5D mk2 . Bubbles are fast slippery little critters We normally shoot using Sinar but as bubbles are fast slippery little critters we needed that extra bit of mobility. As for lenses, we used mainly standard zooms and the pin sharp Canon 100mm macros. The model for the head shots was Beulah from MOT and hair & makeup was by Carolyn Roper from Teresa Fairminer Associates – Carolyn is also a fantastic body painting artist. Originally our client wanted shots of the bubble deforming as it burst . We did eventually achieve this after some experiment but unfortunately the brief changed and they were never used, but it was fun getting results like these ( see below ).